Fantastic food, spectacular live music, and dining with a view- these are just some of the ways you can describe Muddy Waters! 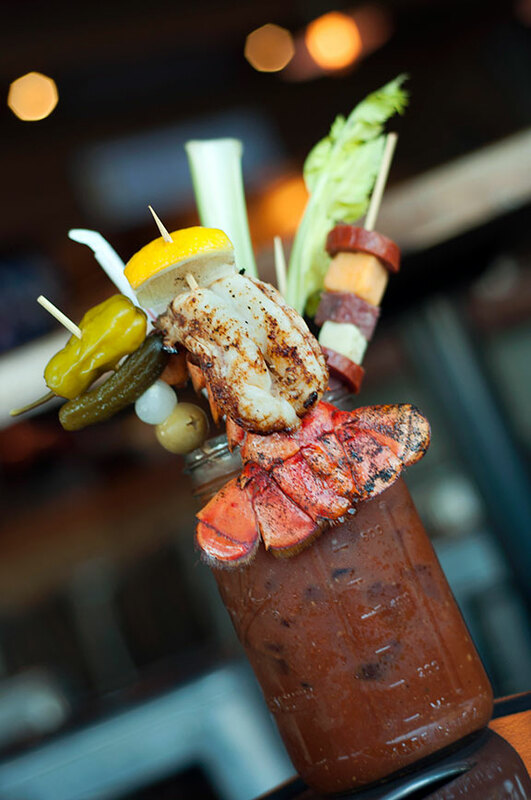 The ever-impressive Lobster Bloody Mary complete with Muddy Waters’ signature Bloody Mary mix, vodka, topped with a 5oz Lobster Tail and garnished with a skewer of cheese cubes and meat and an additional skewer of giardinieral! They are located along the banks of the Seneca River at 2 Oswego Street in Baldwinsville. 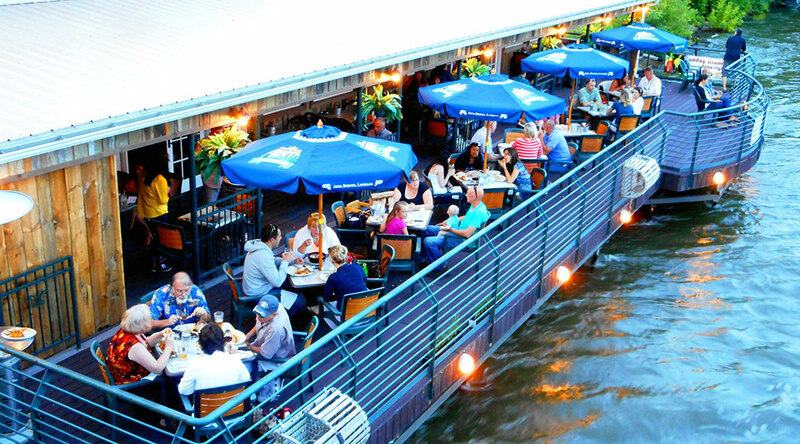 You won’t want to miss a trip to Muddy Waters this summer where you can sit on the River Deck watching the water while enjoying one of their signature cocktails, huge selection of craft beers on tap, one of their Famous Hurricanes, or even a glass of Bourbon! Right now the kitchen is open Wednesday through Saturday from 3 pm to 9 pm and on Saturdays and Sundays for brunch from 10 am to 2 pm. Beginning in May they will be extending their hours and adding extra time by opening for “Fat Tuesdays” from 3 pm to 9 pm and hosting “Sunday Funday” after brunch from 4 pm to 9 pm! At Muddy Waters you are certain to get an experience unlike any other in Central New York. They have successfully created a menu and atmosphere that almost makes you think you are on vacation! Between the divine smell of great food being prepared and the New Orleans décor you can’t help but feel like you have been transported somewhere south of the Mason-Dixon Line! They specialize in homemade southern comfort food, traditional barbeque and they even sprinkle in some Bourbon Street. They pride themselves on serving customers dishes that are equal parts scrumptious and visibly appealing. These recipes have been created just for Muddy Waters by using recipes that have been gathered over six generations and across three families with strong southern influences. There is always something cool happening at Muddy Waters. They have live music on the weekends (moving outside on May 20 through Labor Day, on Tuesdays and Sundays, so you can enjoy the River Deck). There are great bands booked all summer long! Here is the April line up: Friday April 6 -Pop Rox, Saturday April 7- The Barndogs, Friday April 13 – Brass, Inc., Saturday April 14 – Shining Star (Grateful Dead Tribute), Friday April 20 – Sharp Dressed Penguins, Saturday April 21 – Joey Belladonna’s Chief Big Way, Friday April 27 – Dangerous Type, Saturday April 28- Bad Mama’s Blues Band. All shows start at 8:30 pm so be there a bit early to grab a good seat and an awesome meal! 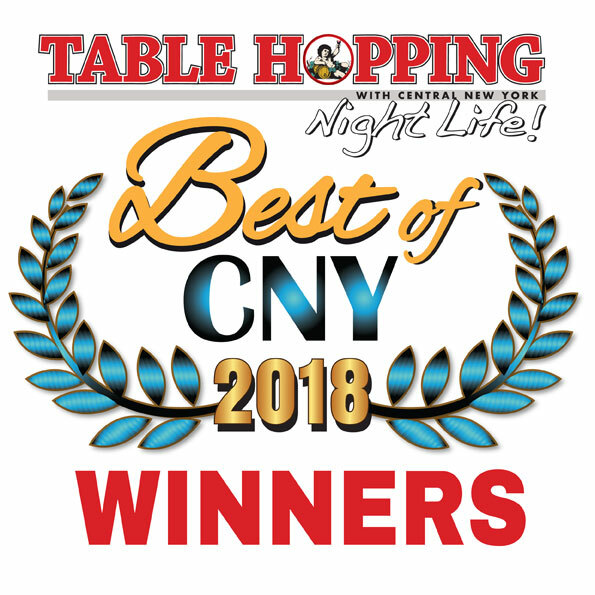 They also boast a daily happy hour from 3 pm to 6 pm with 2 for 1 margaritas and hurricanes, $3 cans and mixers, and $8 pictures of Muddy Waters Lager! They are hosting an unforgettably big Derby Party on May 5th for the Kentucky Derby from 4 pm to 6 pm (it’s also Cinco de Mayo) with tons of food and Bourbon specials. You won’t want to miss out on the Derby Party because in addition to all of the specials they are hosting their own derby- and by that I mean Crawfish Racing! Speaking of crawfish, it’s crawfish season! You won’t want to miss out on a single, mouthwatering, crawfish boil! At Muddy Waters they serve the freshest crawfish around because they are flown in from Louisiana. Starting in May you won’t want to miss “Fat Tuesdays” with live entertainment outside on the River Deck from 6 pm to 9 pm where you can hear some great tunes and enjoy incredible drink specials like 2 for 1 margaritas and hurricanes! Dining with a view at Muddy Waters on the Seneca River in Baldwinsville, NY is the only way to go! The dining experience at Muddy Water is nothing short of incredible. Muddy Waters’ owner, Tom Taylor and Chef David Taylor, along with their knowledgeable and friendly staff have worked hard to craft dishes that you just can’t find anywhere else around! They have an outstanding burger menu with deliciously clever creations like “The Royale with Cheese” and “The French Connection”. If wings and barbeque makes your mouth water Muddy Waters boasts two outrageous all you can eat specials! On Wednesdays come in for all you can eat chicken wings, thighs and drumsticks from 3 pm to 9 pm for only $13.99. On Thursdays be sure to get your fill of all you can eat barbeque- buffet style sides (such as mashed potatoes, salt potatoes, cornbread, mac n cheese, salads, coleslaw, rice and baked beans), ribs, pulled pork and chicken- at the unbeatable price of $22.99! Muddy Water is also the best place in town to brunch. Kyle and I went and grabbed brunch at a table with a great view on Sunday. We indulged in a skillet of brunch poutine (home fries, brown gravy, crispy bacon and melted NY cheese curds all topped with fried eggs! Words can’t even describe how amazing this dish is! We also tried the artfully crafted chicken & waffles (Belgian waffle topped with fried chicken and butter drizzled in yummy maple syrup) This southern classic is a must order if you love the decadent mix of sweet and savory! We also tried the Eggs Voodoo, an inventive take on the traditional “Benny” with two poached eggs atop fried green tomatoes, sausage patty, and an English muffin- smothered in the perfect amount of hollandaise and topped with chunks of REAL crab meat! This dish with it’s symphony of flavors had us both under it’s spell! We weren’t ready to leave because the sun was shining, the river was flowing, and the music was great, so we decided to indulge in an impressive and should be world famous Lobster Bloody Mary! This culinary meets libation masterpiece is basically a meal in a glass. First they take their signature Mary Mix and blended in some vodka. Then they top it with a 5 oz Lobster Tail and garnish it with a skewer of cheese cubes and meat and another skewer of giardiniera! (these come in two sizes 32 oz for $19.99 and 16 oz for $14.99) Our visit left us both impressed with the generous portions, beautiful presentation and attention to detail. 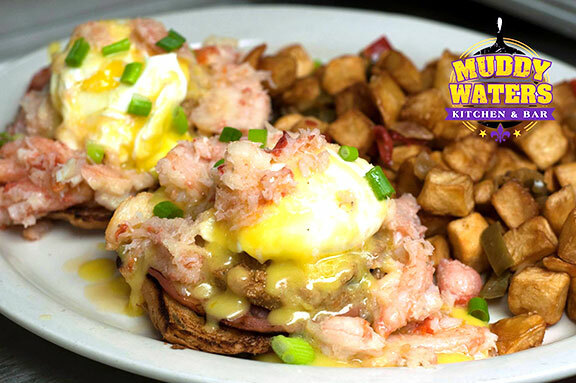 Muddy Waters famous Eggs Voodoo-two Poached Eggs atop Fried Green Tomatoes, Sausage Patties, and an English Muffin all smothered in Hollandaise and topped with chunks of real crab meat. Be on the lookout for some upcoming menu changes bringing you new and delectable dishes. Muddy Waters is the perfect place to take the family for brunch so make your reservations at 315-635-8500 for Easter and Mother’s Day! Be sure to check out their website at http://www.muddywatersbville.com/. Don’t forget to like them on Facebook so you can keep up with all of their amazing events, specials, live music schedule and so much more! If you are cruising the Seneca River stop in by boat- there is convenient public docking on either side of Lock 24. 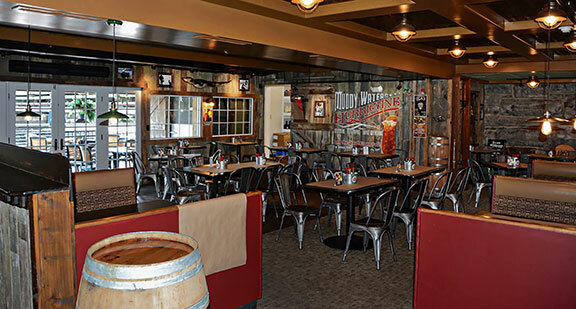 Muddy Waters is also the perfect place to stop if you are headed to see a show at the Budweiser Amphitheater! At Muddy Waters you will have an unbeatable experience so head on over today!